June in Chicago can be a little bit unpredictable. Thunderstorms are frequent visitors that will send all into hiding with their sheer force and strength. Luckily, on my last business trip out to Chicago this June, we were blessed with one beautiful summer day. When that happens, the best thing you can do is be outdoors as much as you can to soak up every minute of it. 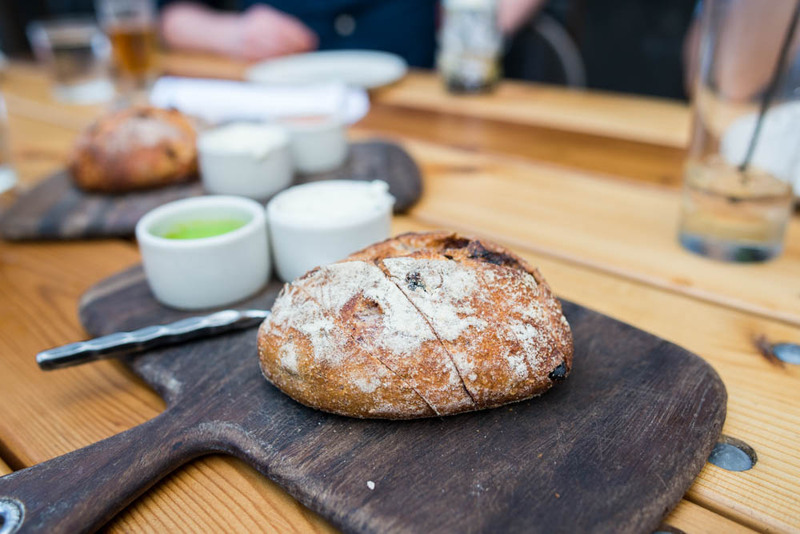 We did just that by extending our time in the sun with dinner al fresco at Girl and the Goat. 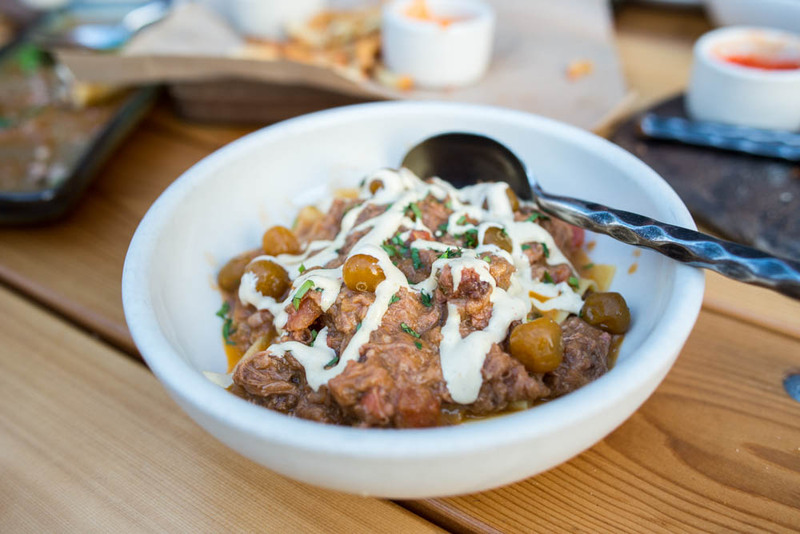 Since it was my second time dining at Stephanie Izard’s West Loop spot, I had a pretty good idea of what dishes would make it onto our dining table and luckily with a larger group, we were able to sample a wide range of dishes to my not-so-secret delight. 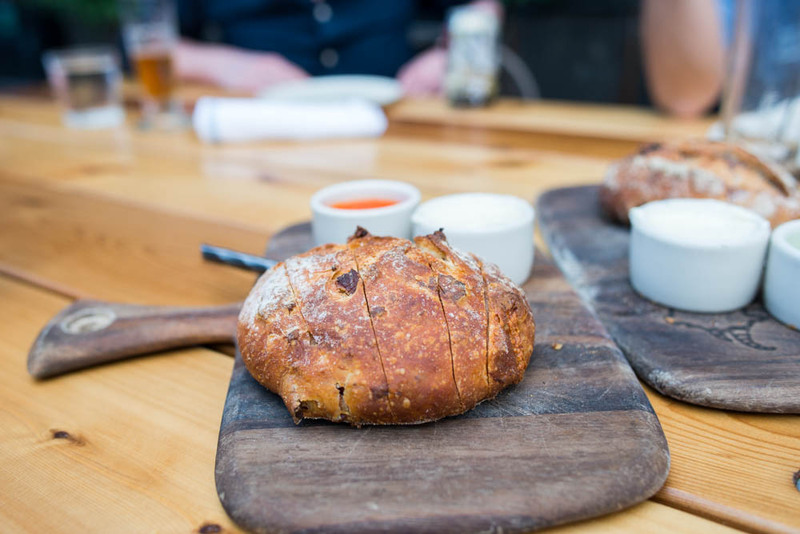 We started the evening with a maize and blue bread with goat cheese butter and pea puree and a gouda bacon bread with back fat butter and romesco. As good as the maize and blue bread was, the competition was just too stiff and the cheesy savory gouda bacon bread with a smear of even more pork goodness known as back fat butter won out. One of my favorites from my last meal was the goat empanadas. Two crispy fried pockets came in an order so we had to triple up on it. 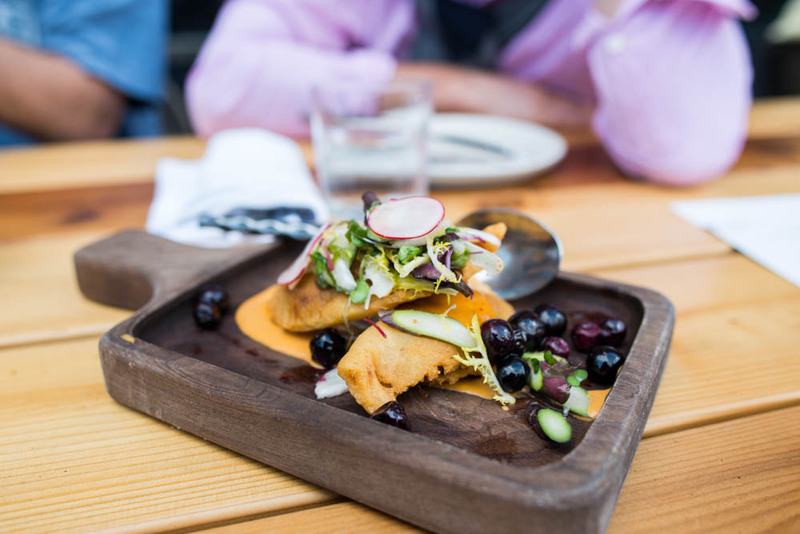 The grilled blueberries were an unexpected yet pleasant summer touch to the meaty empanadas. Two more dishes to nibble on as we enjoyed our beers. 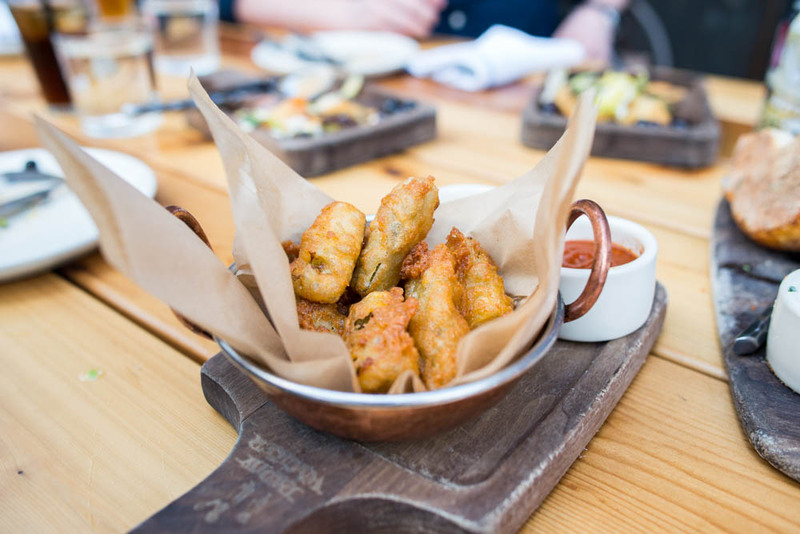 I love a good fried pickle and the ones at Girl and the Goat were pretty on point with their crispy yet not doughy shell. The pickles came with shallot aioli and yuzu harissa. Both paired equally well with the pickles but I favored the depth of flavor that the harissa dip had that was perked up by yuzu. 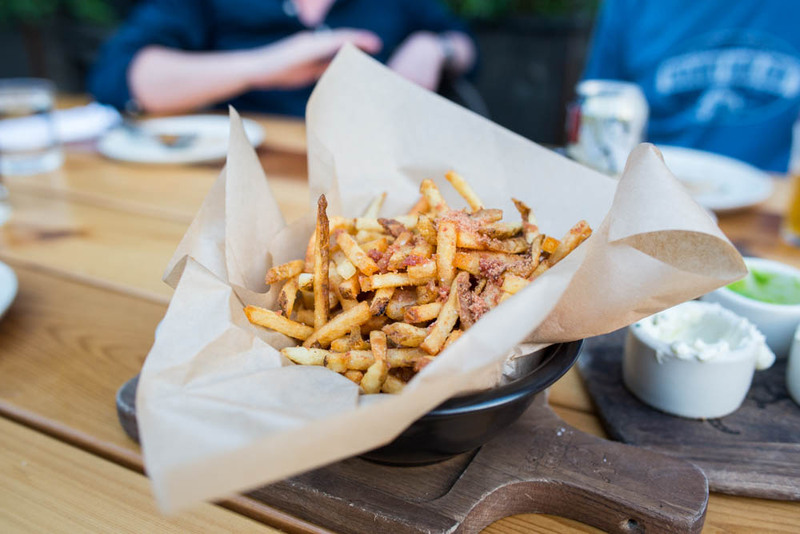 And what can you do to make something as simple as french fries taste delicious? Why not dust it with ham bits and serve it with addicting sauces like smoked tomato aioli and cheddar beer sauce! Both were so equally delicious that I couldn’t make up my mind as to which was a favorite as I alternated dipping the crispy fries into the sauces. 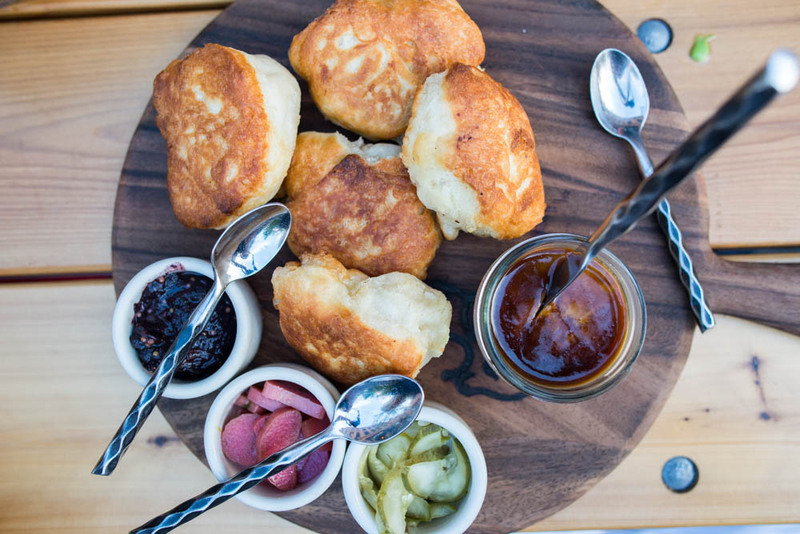 As the name of the restaurant has hinted, goat is a star ingredient in many dishes here. It was my first time having goat liver mousse and I have to say, it was quite the experience. The gamey flavor of goat definitely jumped out so if you aren’t a die-hard fan, I would caution against ordering the dish. Served with warm and flaky crumpets, the mousse was whipped into a blissfully smooth submission. A pot of blueberry mostarda and some pickled rhubarb balanced the dish nicely with a little bit of sweet and a little tartness. From there we moved onto lamb stuffed calamari, another creative dish, this time featuring lamb instead of goat. 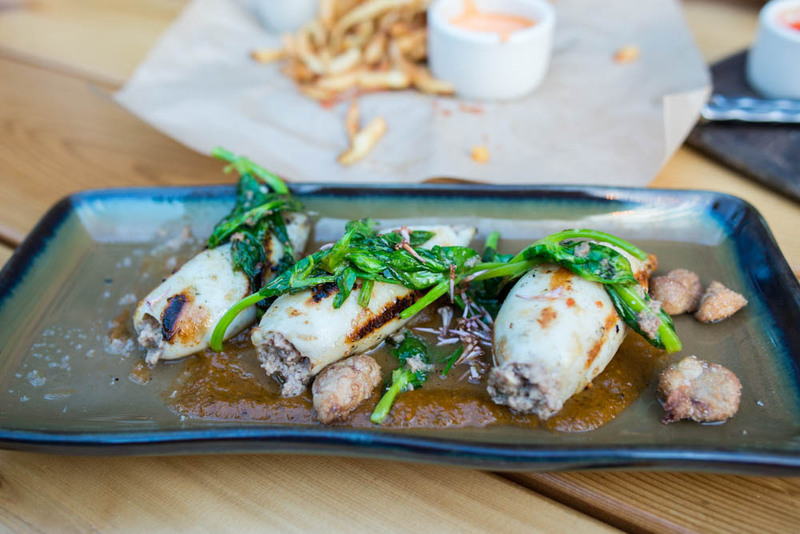 The calamari pieces remained tender and were bursting with flavorful filling made with ground lamb. What made this dish even more special was the accompanying ramp mole and lamb sweet breads scattered around the dish. The sugo with pappardelle, rosemary and cape gooseberries might have been the least photogenic dish of the night but it was one of my favorites. The pasta was al dente and tender, served with a succulent and rich meat sauce. The gooseberries were a nice surprise that added a hint of sweetness. 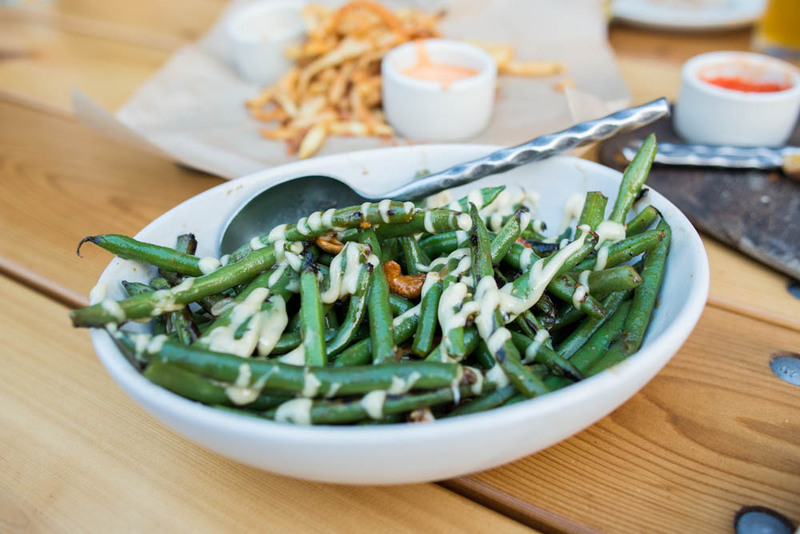 Just so we can say we had our daily vegetable intake, we chose the wood grilled broccoli and sauteed green beans. The broccoli salad outshined the weaker green beans with its smokey char, rogue smokey bleu and spiced rice crispies for crunch. 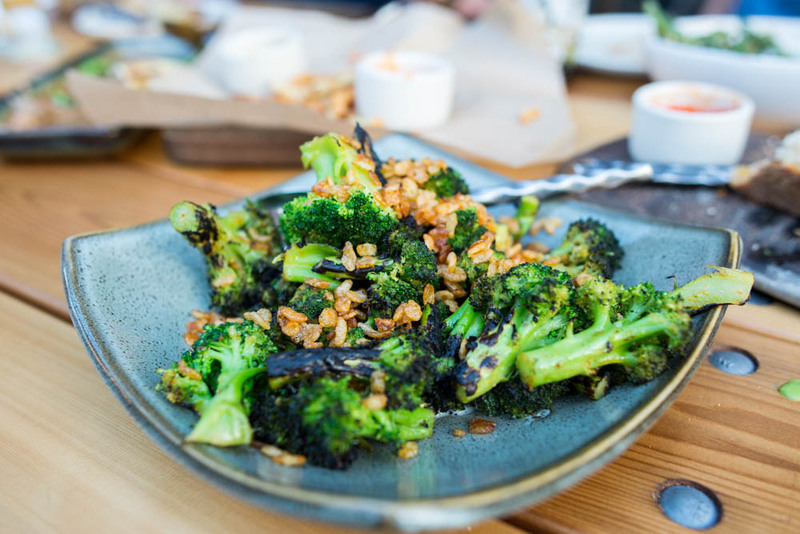 Now if this doesn’t make a broccoli lover out of you, I don’t know what will. There was just one last dish before we threw in the towel and called it a night. 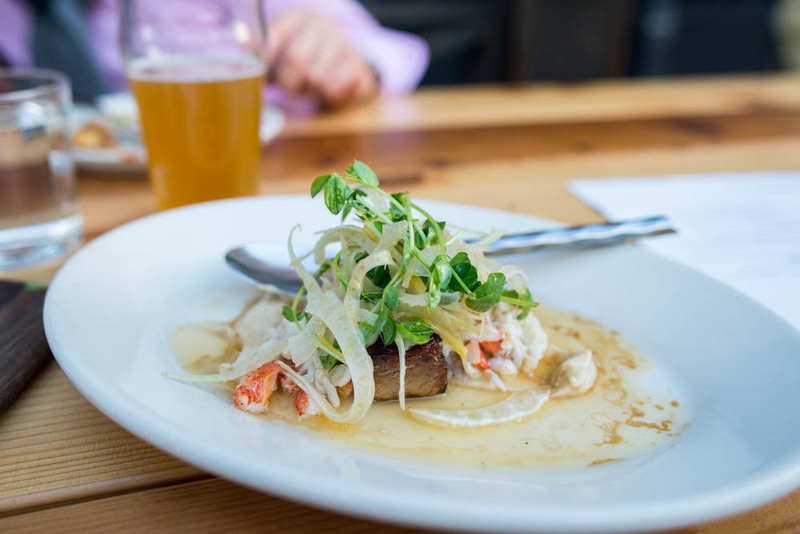 The confit of goat belly with bourbon butter, lobster n’ crab and fennel was delicate yet balanced. A great take on surf and turf that would have been much better appreciated earlier on in the night before we stuffed ourselves silly with the myriad dishes, many featuring one of my favorite meats, goat. Have you tried Alinea or Next?